Basic details about Twitter co-founder Jack Dorsey's plans for an iPhone credit card payment service have been floating around for some time, but it appears that his SquareUp startup has finally gone live for trial users—and it looks promising. There are several apps on the iPhone designed to accept credit card payments but, as far as I can tell, SquareUp has the best set of features. It doesn't require any contracts or monthly fees, and card payments can be accepted through a small device that plugs into the audio jack. Receipts can be sent via email or viewed online and text messages can be used to verify payments in real time. There are even benefits to using the service for cardholders, much like the points you might accrue for making purchases. 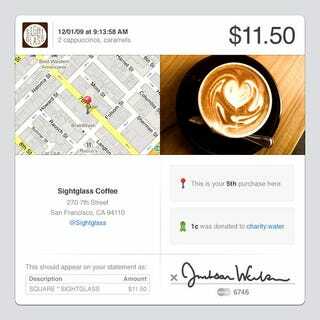 SquareUp lets business owners know that you are a repeat customer that may be entitled to a freebie—kind of like punch cards do now. They also donate one cent of each transaction to the charity of your choice.